​☾ Integrating her arts and earth appreciation, inspired by nature and landscapes, Katy crafts pieces using raw brass, semi-precious stones, raw minerals and crystals into trendy but classic art adornments and sentimental pieces that you will keep for years. Katy is a Mama, jewelry designer and creator, crafter, lover of nature and all things handmade and organic. She has a broad background in dance, kinesiology, nutrition and environmental studies. She is thrilled most that she gets to do what she loves for a living, designing, creating jewelry, photographing, writing, connecting with people from all over the world, all while being able to stay home with her kids. Each piece of jewelry is handcrafted with love and good intentions. Proudly made in Canada. Daily inspirations and curiosities include, crystal and mineral specimens, medicinal and spiritual power of flowers and herbs, essential oils, design, astrology, photography, the woods, her French bulldog named Munchkin, the moon & lunar cycles, energy, the desert, bird watching, food healing, ecology, vintage fashion, the southwest, antiques, love and animals. © 2018. 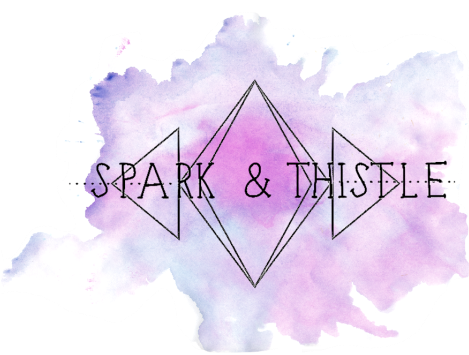 Spark And Thistle.